In my last post I presented the City of Lost Souls. The idea of the city has been in my mind for a long time as a city that originally was created by outcasts from the ordinary society. Outcasts that in the end have created a powerful city, a city made untouchable because of its location in the middle of a maze like river delta. In this post and the next couple of post I’ll try to describe the process I’ve developed when I create cities. I don’t say that this is the best way to do it but it is one way to do it. 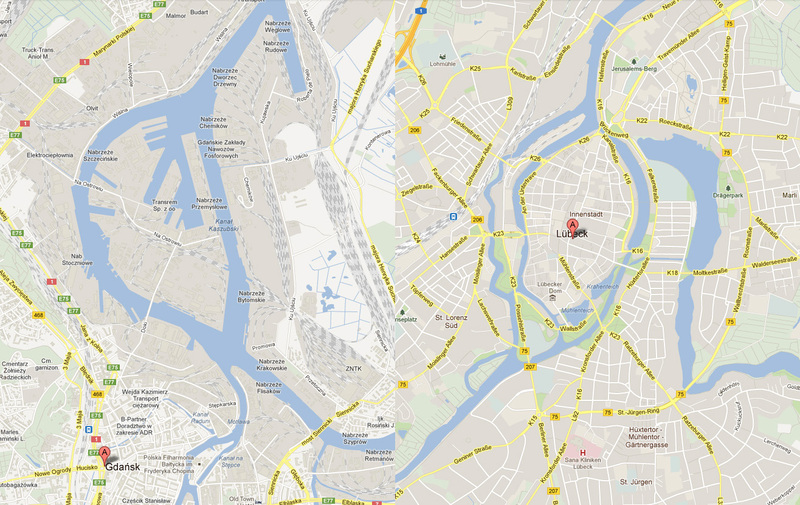 To exemplify the process I’m using I will use the map of the City of Lost Souls. When I decide to make a map it is always easier to start if you can get some inspiration from the real world. One of the best tools you can use is Google earth. You can learn tons of information just by moving around the globe looking at old cities, land formations and following rivers through the landscape. In this particular case I looked a lot at river deltas and cities situated at the end of rivers. You will never find anything that will look exactly like the part you want to create, but the idea here is to find real world location that can inspire you, and that you can copy bits and pieces from. In this way you can create a map that will look much more convincing than if you just draw something from your head. I soon found two cities that gave me the right feeling. These cities are Lübeck in the northern parts of Germany and Gdansk in Poland. None of them was perfect but I liked the flow of the river around the old part of Lübeck (as you can clearly see in the map), but this part missed a harbor. So I picked the harbor from Gdansk for the map. 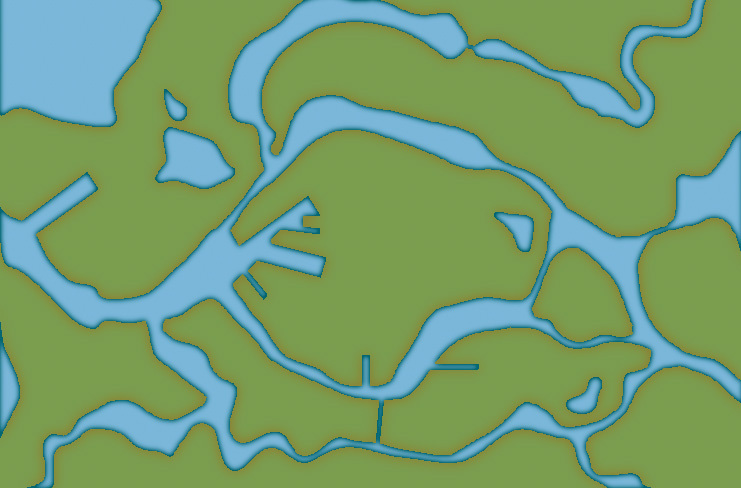 I also added in some more rivers to get the feeling that the city really is situated in a river delta. In City Designer 3 (CD3) I then started a new map and started to draw the rivers. During the process I looked at the cities for inspiration but still trying to do something original. While creating the island where the actual town would be I draw the outline of the harbor already at this stage. In this way the shadows between river and land would be right later on. So at this stage I had a quite clear picture on how I would progress with the city. In the picture below you can see the result when all the terrain was done. Next step would be to start on the actual city. There are places in the world where the souls of the dead and lost still roam. Those places are rare to find and if you find one the chances are that you never leave. 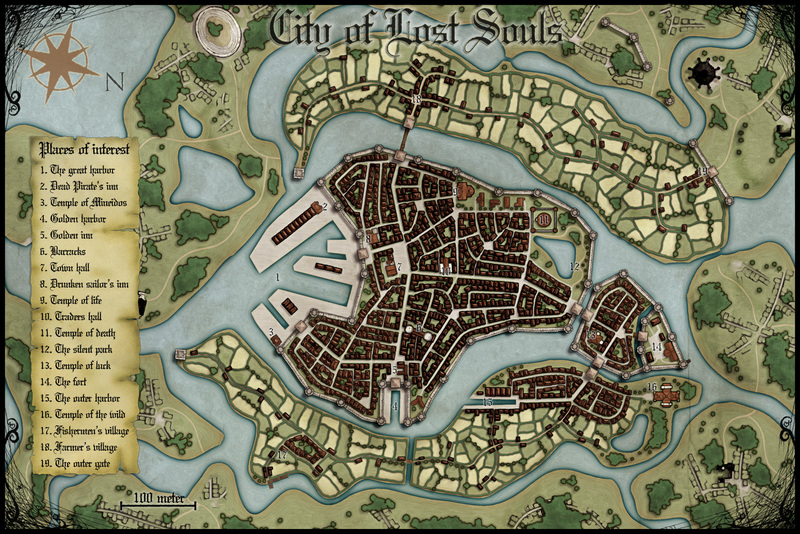 This is the City of Lost Souls situated in a river delta between the countries Truscia and krug in the Etrakien world. The town is surrounded by ancient ruins from a since long forgotten past. Mostly there aren’t more left of the ruins then the foundation on which they once stood. But some larger buildings are rather well preserved and beneath the ground there are vast catacombs and even areas where whole blocks of the old city have been covered with earth. These parts are now excavated during the days to uncover artifacts hidden by the soil. But among the ruins the souls of the dead still walk and guard their hidden treasures, or at least that is what people say. But strange things do happen, it is as if the world isn’t as solid everywhere in the old city as it should be. As if alternative realities shine through the fabric of this world, and if you don’t watch your step you might find it very hard to get back to from where you started. To find your way through the labyrinth that the river delta form you have to follow one of the guiding boats. It is said that only the one that knows the true name of the city can find its way here. And the secret is well protected by the selected few who knows it. The city itself prospers from the diversity of old artifacts that are found in the ruins that surrounds it. It also harbors some of the world’s most famous pirates that pay well for the protection that the city gives. More than once enemy fleets have tried to find its way up through the delta, still none have succeeded. The map is done in City designer 3 (CD3) from Profantasy combining the included styles A and B with the latest annual city style by Jon Roberts.The end result from CD3 has then been quite heavily edited in Photoshop, where the labeling also has been done. In the next post I will go through the process of creating the city. Until then you can have a guess on which two real world cities that inspired me while making the City of Lost Souls. This months annual from Profantasy is a new city style designed by the Fantasy cartographer Jon Roberts. This is the third time that one of Jon Roberts themes are presented as an annual. The two earlier versions have been an overland style and a dungeon style. I must admit that I’ve really looked forward to the release of this annual. First of all I love city maps and CD3, secondly Jon Roberts is a very skilled cartographer and illustrator so I expected some really nice graphics in this one. As expected all the graphics are top notch and I especially like the walls and towers. 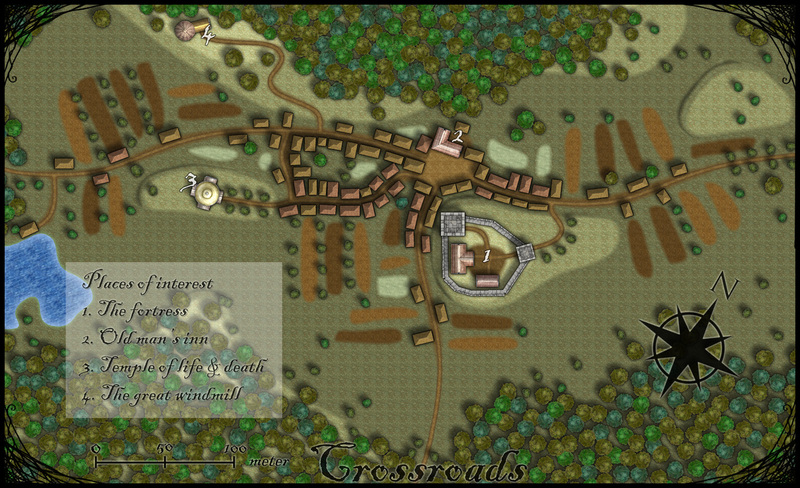 To test the style i decided to make a rather quick village, called crossroads, situated in the middle of a forest. The style was easy to work with and if you have done maps in CD3 before there isn’t really any new things to learn here. One little feature I liked however was the ability to make nice shadows on the hills. You can clearly see this on the hill where the temple of life & death (3) is. After finishing the map there are some things I felt I need to work a bit more on next time I’m using the style. First of all the fields didn’t turn out great in the map,probably I have to try to put some more time on them in the future. When I started doing maps in the included styles in CD3 it took me a long time with trial and error before I got the fields right. So I have some more testing and practice to do here. Another thing to think of is that in this map I had quite some open space between the forests and in the background texture you can see a pattern. I think the solution here is to add in some more different textures to hide the pattern. If you look at the included map in the annual you don’t see this pattern there. At last if you look at the trees in the forest you can see that the northern forest has the trees more closely to each other. I actually think they got too close so in the southern forest I put some space between the trees. This made the forest look much better, in my opinion. Overall I think the style is really nice. I like the darker colours of this one compared to the included styles in CD3 (which means less editing in Photoshop for me) . Still it takes some time to get to know the feeling of a new style, to get all the things in place in a good way. This one surely needs som more practicing for me before I’m there. As usual I added the labeling in Photoshop, and I also selected another font. If you want to use the font I used it’s called Blackadder regular and can be downloaded from dafont.com for free. As I wrote in my earlier post I’ve always been fond of underground constructions by dwarves even though I’m not that fond of dwarves, so I like to inhabit their deserted cities with more fun creatures. This map is an old one I made in Photoshop. It is quite simple and retro in its style but I kind of like the black and white look and feeling of it. Originally it was made for an adventure I was making where the players had to get into the old burial place in the city to retrieve an artifact. The burial site is the oval location on the left side of the map only reachable by water. The players could take different paths into the city. They could either go from the outside top entrance on the map, or the bottom entrance that is situated in a great cave system. The easiest way though would be to go by the underground river. The city itself was abandoned by the dwarves a long time ago and now a small clan of goblins and mountain trolls lives there. So the task wouldn’t be very easy for the brave heroes to complete. Unfortunately the adventure never happened, as many times before it stayed with a map and a synopsis of an adventure. So I can’t tell you if the brave heroes succeeded with their quest or not :). I’ve always been very fond of Dwarves and their mines as a great location for an adventure. I guess you can blame this on Tolkien and his description of Moria. I still remember how excited I was when I saw the Lord of the rings on TV for the first time (now we’re talking about the old film, not the new ones) and they entered the old mines full of orcs. This map however is only of the entrance to a Dwarven kingdom. 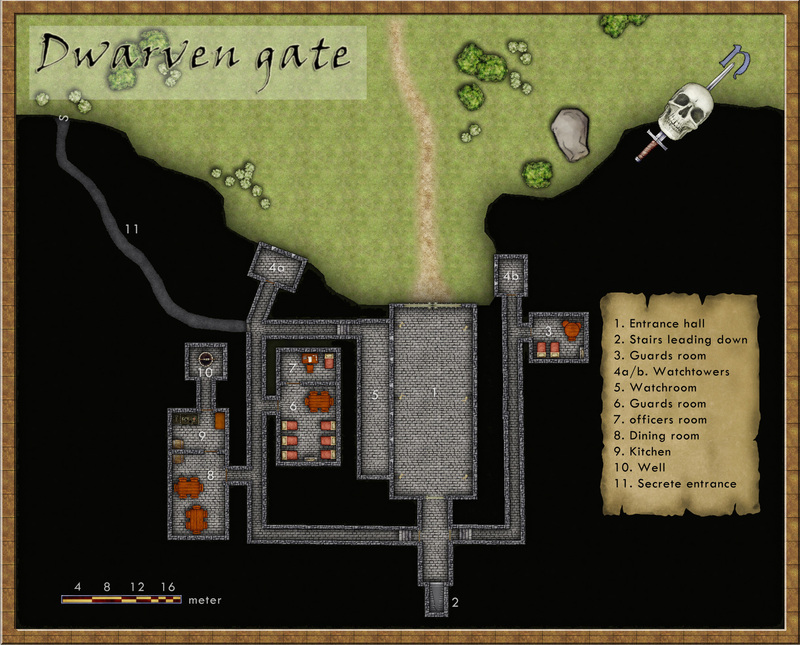 It is made in the Dungeon Designer 3 add on for Campaign Cartographer 3. The style used is from the 2011 annual, Jon Roberts Dungeon. This particular style is actually free for anyone to download. When I map some kind of fortification I always try to picture how an attack on the area would be done. How could I defend the area in the best way? Whoever that want to get past the fort has to pass through the entrance hall (1) on the map. So I wanted the entrance hall to be well guarded, I accomplished this through the watchroom (5) next to it. From there the guards can watch who enters and also shoot at them. The inner iron door will hopefully prohibit any hostile intruders from getting any further in. The two towers facing the outside (4a-b) are also good spotting areas from where you can see who’s approaching as well who’s standing in front of the gates. I try to continue thinking in this way while mapping, other important aspects are where will the guards sleep, eat or relax? Remember this is a place where the guards probably spend a week at a time before they are relived. In the end I also added the secrete passage (11). This passage shouldn’t really be there because it is a huge security risk. The reason I put it there was that if some adventurers need to sneak in past the guards they need a way to do it. So the passage was added to make the map more fun to use in an adventure. This was the first map I made in Dungeon Designer 3. The program however I feel is the most complicated one from Profantasy, mainly because there are so many different things you can add and have to take into account. It took me a long time to realize that I in this map actually by mistake used the wrong beds and tables (they are from another style then the one I intended to use). So it was very good to have the pdf from the annual style to use as a guide while exploring the program. This however doesn’t mean that this is a bad program in any way, probably the contrary. But it crave from you as a user that you take the time to learn it.